Professor Stefan Hussong unterrichtet Akkordeon und Kammermusik an der Musikhochschule Würzburg . Er ist vielseitig bewandert auf diesem noch jungen Instrument Unter seinen ca 30 Veröffentlichungen finden sich unter anderem Interpretationen von Bach, Frescobaldi, Soler, Sweelinck, Piazzolla. Im Juni nahm er mit seiner Akkordeonklasse an einem transatlantischen Projekt in Calgary (Kanada) teil. Ge­mein­sam mit drei­zehn Stu­die­ren­den der Kom­po­si­ti­ons­klas­se von Prof. Da­vid Ea­gle (Cal­ga­ry) er­ar­bei­te­ten die zehn an­ge­reis­ten Stu­die­ren­den aus Würz­burg Wer­ke für Ak­kor­de­on. Die Aus­ein­an­der­set­zung mit dem Ak­kor­de­on bot den an­ge­hen­den Kom­po­nis­ten in­ter­es­san­te Ein­bli­cke in die -​ von vie­len un­ter­schätz­ten -​ Mög­lich­kei­ten die­ses In­stru­ments. Die Ak­kor­deo­nis­ten wie­der­um er­fuh­ren um die bis­wei­len heik­len Her­aus­for­de­run­gen, die ihr In­stru­ment an Kom­po­nis­ten stellt. Hö­he­punk­te die­ses für bei­de Sei­ten ein­zig­ar­ti­gen Stu­di­en­an­ge­bots bil­de­ten ne­ben pro­fes­sio­nel­len Ein­spie­lun­gen der Wer­ke im Ton­stu­dio die Ur­auf­füh­run­gen beim “Ac­cor­di­on-​Spec­ta­cu­lar”, der .Auf­takt-​Ver­an­stal­tung des “Con­trasts Fes­ti­vals” in Cal­ga­ry. 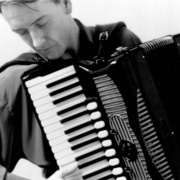 Prana, the Sanskrit word for “breath”, is inspired by the accordion’s ability to produce sound by a manipulation of air analogous to breathing. The opening is characterized by denser musical material as well as uneven rhythms and bellow shakes comparable to shallow, irregular breathing. Daniel Marshall is a Canadian composer originating from Calgary, Alberta. He is currently studying composition at the University of Calgary under Allan Bell, David Eagle and Laurie Radford. In addition to composing music for the concert hall, Daniel has also produced an outdoor sound installation which was displayed on campus at the University of Calgary. In his free time, Daniel enjoys playing piano as a volunteer in various areas of the community including churches and schools. A Mudang is a Korean shaman, usually female. Possessed by her gods and spirits during a rituals known as /gut/, she divines, exorcises, and heals. Her rituals are accompanied by a battery of traditional percussion instruments, peachtree branches, bell-trees, incense, and an awe-struck crowd. As the first chord is heard, she begins her ritual by calling all her gods and spirits, inviting them into her body. Then, she sings, chants and pleads to the spirits now residing in her body, to grant her their powers. As she catches her breath and starts to dance, her consciousness drifts away while she beckons the spirits to take control. In a swirl of thick smoke, the clangor of music and the excited murmur of the crowd, the noise suddenly muffles and time slows down — she is entranced. Propelled by spiritual ecstasy, she hastens her dancing feet. ‘Checkered World’ obviously implies a world which is marked by light and dark patches; like a chessboard. For me, what this music evokes is an old Iranian device which had openings that you could look through and see beautiful and colorful checkered images while listening to a wonderful kind of children’s music. This was before the invention and popularity of television and cinema. Ali Nader Esfahani is an Iranian composer who graduated with his bachelor’s degree in physics and completed his master’s program in composition. He moved to Canada in 2008 in order to continue his graduate studies. He is currently a student at the University of Calgary. Exponitormentum Fatorum refers to an engine of Fate. In some beliefs, there is a creation that governs the Fate or outcome of all things. In some cultures it is seen as a wheel or clock or river and in others it has been a deity. In this work the composer has taken a more literal view, giving it an industrial image. Michalis Andronikou (1977) graduated from the Department of Music Studies, University of Athens, Greece. He holds a Diploma in Classical Guitar, Clarinet and Music Theory from the Trinity College and the Royal Academy of Music, and a Diploma in Byzantine Music from the Argyroupolis Municipal Conservatory. Michalis gained a degree in Harmony, Counterpoint, Fugue, and Music Composition (Prof. Theodor Antoniou) from the Hellenic Conservatory. Moreover, he has studied Greek folk instruments such as Constantinople lute, tampoura and bouzouki. Currently, he is a doctoral candidate (ABD) in Musicology at the Music Department of the University of Athens and a PhD student in composition at the University of Calgary. Michalis has composed music for theatre plays, for small and large ensembles, songs, etc. Five CDs with his works have been released in Greece since 2003. His score of a guitar duo entitled “Latin Suite” is published by the Bulgarian company Balkanota.